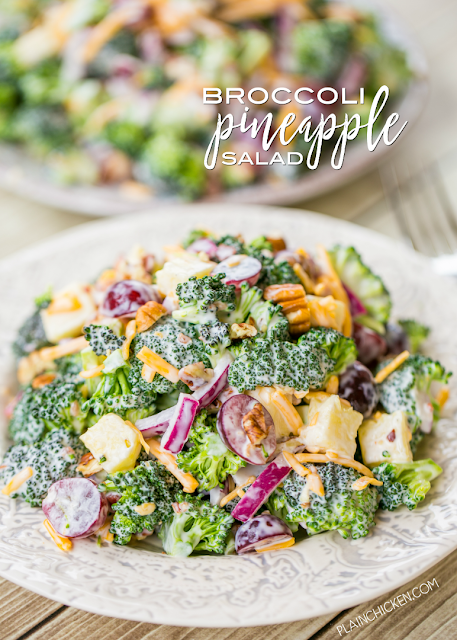 Broccoli Pineapple Salad - so simple and SOOO good!! Seriously delicious!! Fresh broccoli, cheddar cheese, red onion, red grapes, fresh pineapple, pecans, bacon, mayonnaise, cider vinegar and sugar. Great for spring/summer cookouts, potlucks, camping and Easter side dish! We ate this for lunch and dinner the same day. Can make ahead and refrigerate for several days. Such a quick and easy fruit and vegetable side dish recipe! 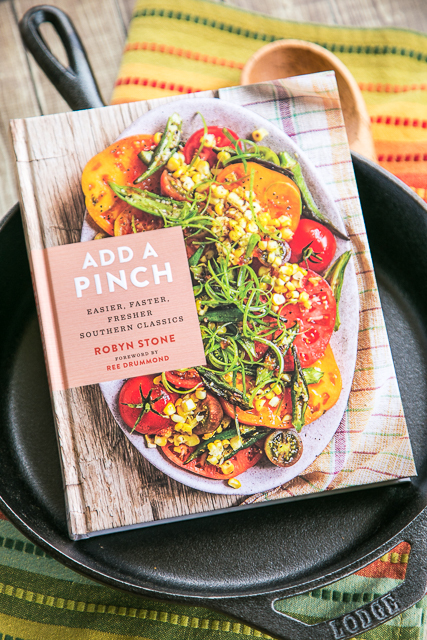 Today I am sharing with you a fabulous recipe from the brand new Add a Pinch cookbook by my blogging friend, Robyn Stone. This is Robyn's debut cookbook, and it is fabulous. It is packed full of mouth-watering recipes. There is something for everyone in Add A Pinch - Starters & Snacks, Skillet Suppers, Slow Cooker Suppers, Casseroles & One-Dish Suppers, Simple Sides, Soups, Stews, Salads & Slaw, Biscuits & Breads, Sweet Ending and Southern Pantry. All of the recipes are easy to make and taste delicious!! Look at that cover photo! OMG! I want to eat it right now!!! 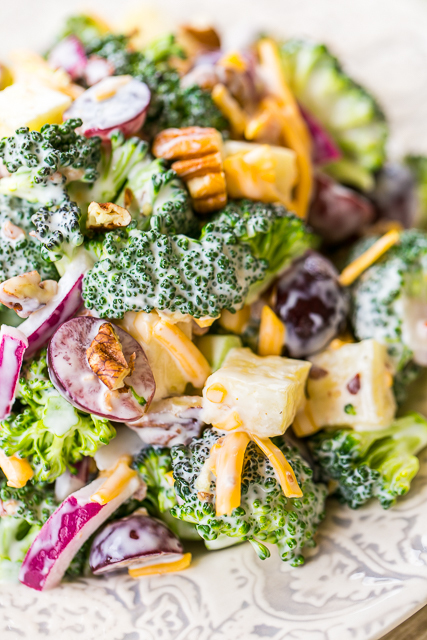 I had a really hard time picking just one recipe to share with you, but I finally decided on this Broccoli Pineapple Salad. We love broccoli and pineapple, so we were excited to try this! The hardest part of the recipe is chopping all the fruits and veggies. This recipe is super simple and crazy good!! I made this yesterday, and we ate the Broccoli Pineapple Salad with lunch and dinner. It is really, really good. We could have actually made this our meal! Chicken Legs said this needed to be on the menu at our favorite bakery cafes! It would be the most popular side dish on the menu! LOL! This Broccoli Pineapple Salad makes enough for 6 to 8 people. It would be great for a spring/summer cookout, potluck, camping or Easter side dish. It will keep for several days in the fridge. I can already tell you that this will be a staple in our house this spring and summer. SO good!!! I can not wait to try all of the other delicious recipes in Add A Pinch! I know you will all love the cookbook too! The book will be in stores on March 28, 2017. You can order a copy at https://addapinch.com/cookbook/. I loved this cookbook so much that I'm giving one lucky Plain Chicken reader a chance to win their very own copy! Use the widget below to enter!! 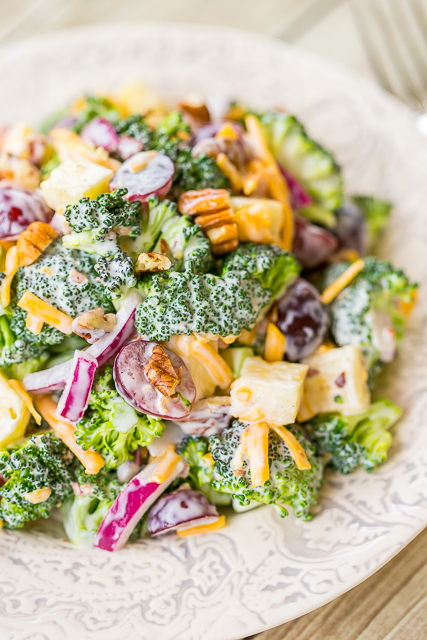 In a large bowl, combine the broccoli, cheese, onion, grapes, pineapple, pecans and bacon. In a small bowl, combine the mayonnaise, vinegar, and sugar. Spoon the dressing over the broccoli mixture and toss gently until evenly coated. OMG! This sounds amazing! The flavor combinations will be a family hit! Thanks for sharing. I make broccoli salad but have never thought to add grapes, pineapple and/or pecans. I'll have to try this one next time. It sounds really good. Can't wait to make this. Love the combinations. WE MADE THIS YESTERDAY,SOOO EASY JACK LOVED IT NOW IT IS ON OUR SUMMER HAVE TO HAVE LIST!!! THANK YOU SO MUCH!!!! THE DRESSING WAS AWESOME!!! Would sour cream work in place of the mayo or yogurt? Greek yogurt and sour cream taste almost exactly the same. Greek yogurt however, has about 20 grams of protein in a cup, and sour cream does not. Greek yogurt and sour cream taste almost exactly the same. I have started using greek yogurt instead of sour cream in just about everything. Greek yogurt has about 20 grams of protein in a cup and no fat or added sugars. It makes things smooth and creamy. I love it. WE MADE THIS AND IT WAS AWESOME !!! AND YES, IS A KEEPER!!!!!!! How far ahead can you make this salad? How long will it keep in the fridge?